Plain bearing and rod end designs that require maintenance with steel/steel and steel/bronze material pairs are easy to maintain, cost effective, and excellently suited to alternating loads. Plain bushes, washers, and strips employ the low-maintenance metal-polymer composite E50. The sliding layer features lubricant pockets, which means that an initial lubrication is sufficient in most cases. Radial spherical plain bearings comprise inner and outer rings with steel/steel or steel/bronze sliding contact surfaces and are lubricated via the inner and outer ring. The bearings are particularly suitable for alternating loads with impact and shock type stresses and support low axial loads in both directions. Angular contact spherical plain bearings comprise inner and outer rings with steel/steel sliding contact surfaces. They transmit motion and loads with low moment levels and thus keep bending stresses away from the adjacent structure. Axial spherical plain bearings comprise shaft locating and housing locating washers with steel/steel sliding contact surfaces, can support axial forces and transmit support forces with low moment levels into the adjacent construction. 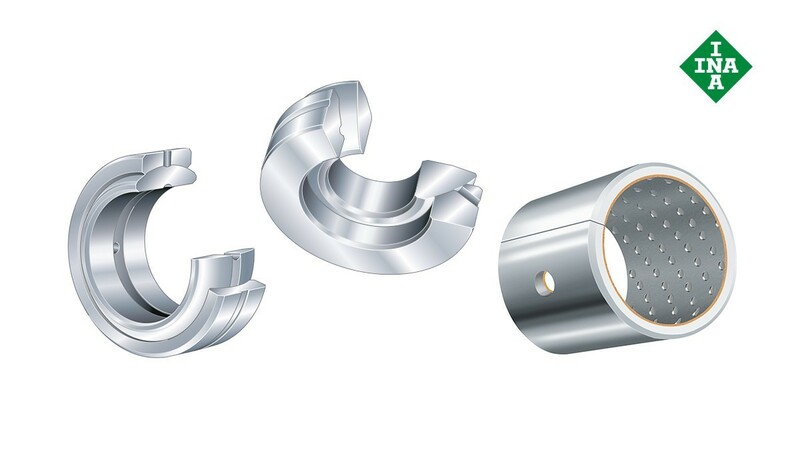 These rod ends comprise a housing with integral shank and a spherical plain bearing requiring maintenance. They can support radial forces in a tensile or compressive direction as well as transmit movements and forces at low moment levels and are suitable for alternating radial loads and, under certain conditions, unilateral loads. INA metal-polymer composite plain bearings are a cost-effective alternative for many industrial and automotive applications. 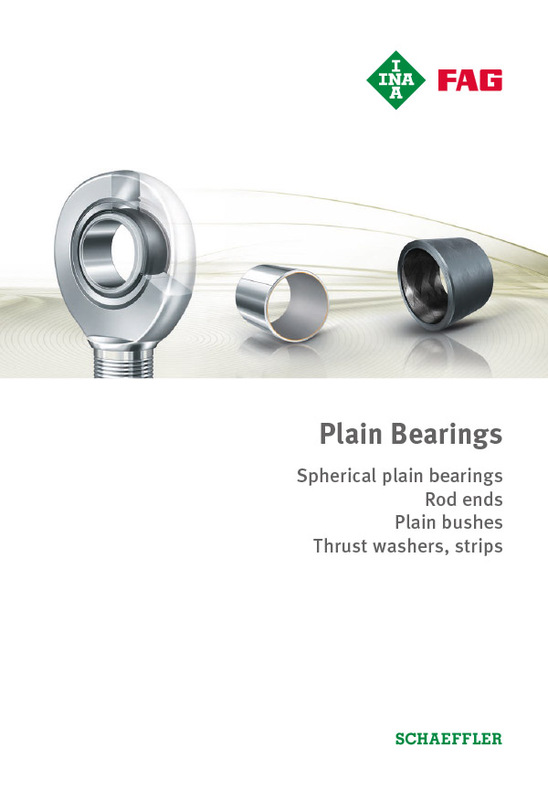 All bearings are lead-free and, therefore, environmentally friendly. Different innovative material combinations ensure a large variety of maintenance-free or low-maintenance materials. Bearings with sliding layer E50 require initial lubrication at the start of operation. This sliding layer comprises mainly polyoxymethylene (POM), a high-molecular thermoplastic that is distinguished by low friction values as well as chemical and thermal stability. This layer also contains inert additives. The triple-layer material comprises the steel backing, the intermediate layer and the sliding layer. The steel backing has a sintered porous tin/bronze intermediate layer whose pores are filled with the sliding layer. Sliding speed of up to 2.5 m/s.